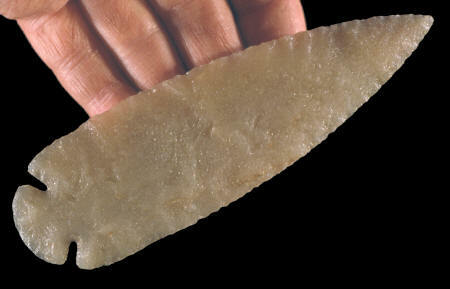 This St. Charles “Dovetail” point was found several years ago in Jo Daviess County, Illinois. It most probably was used as a knife that would have had a short handle made of either wood or bone. It appears to have been resharpened no more than once, if at all. This point dates to the Early Archaic period sometime between 9,500 to 8,000 years ago. “Dovetail” points have been found in as many as 17 different states, most of them east of the Mississippi River. This point is made of Hixton silicified sandstone and measures 5 1/8 inches (13cm) long.